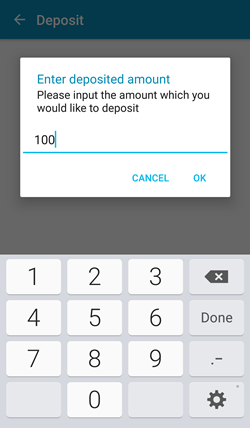 In the mobile main menu, choose Deposit in order to top up your Moneymailme wallet with funds. The below steps are repeated every time you want to top up your account. No data is saved; every new requirement is a new payment form. You will be asked to choose the payment method: CB/Visa/Mastercard, along with the amount. The amount is expressed in your wallet currency. After this, you will be redirected to a 3D Secure page where you must provide your payment method information. After validation, you should be able to see a message saying that transaction has succeeded. A top up fee will be charged from the input amount for each deposit. The balance of your wallet will be updated immediately. A confirmation of the deposit will be sent to the email associated to your Moneymailme account. Note: The minimum amount to deposit within a transaction is the following (depending on your wallet currency): 20 EUR, 20 GBP, 20 USD, 20 CHF, 80 PLN or 280 ZAR. Note: The maximum amount to deposit within a transaction is the following (depending on your wallet currency): 500 EUR, 500 GBP, 500 USD, 500 CHF, 2000 PLN or 7000 ZAR. A top up fee will be charged from the input amount for each deposit. A confirmation of the deposit will be sent to the email associated to the M3 account. Note: This is a transaction on your account. See Transactions section for more details. Note: The balance of your account will be updated in the main menu immediately.